FILE PHOTO | The state capitol in Albany. Local and county Republican committee leaders met with seven potential candidates for the state Assembly seat vacated this month by Dan Losquadro, though it still remains unclear if a special election will be held anytime soon, party officials said. Mr. Losquadro, of Shoreham, left state office less than four months after being elected to a second two-year term in Albany in November. He was voted in as Brookhaven Town highway superintendent March 5. The 2nd Assembly District encompasses all of Southold and Riverhead towns, and stretches as far as Mount Sinai along Brookhaven Town’s northern shore. Governor Andew Cuomo must decide when to hold the special election for the remainder of Mr. Losquadro’s term. “Nobody knows if [the special election] is going to be lumped into the general election,” said Riverhead Republican Committee chairman John Galla. The names were provided by Mr. Galla, who said he was impressed with all the candidates. Catherine Stark, a Riverhead Republican Committee member and aide to county Legislator Jay Schneiderman (I-Montauk), is considering screening but had a scheduling conflict Wednesday night, he said. Southold and Brookhaven party chairmen also attended the screenings. Mr. Galla said he agrees the special election coincide with the May 21 school budget votes, something the Times/Review Newsgroup editorial board has called for, rather than on Election Day. Calls to the Governor Cuomo’s office about the special election have not been returned. “I’m not going to bash the governor, but I would ask him [to agree to a May special election], had I had the opportunity. I think he would agree on some level that the people of the Assembly District should be represented” from now until November. County leader John J. LaValle was not immediately available for comment. Read more in the March 28 News-Review newspaper. PAUL SQUIRE FILE PHOTO | Governor Andrew Cuomo must decide when a special election for the recently vacated 2nd Assembly District seat will be held. More than a week has passed since Dan Losquadro was sworn in as Brookhaven Town highway superintendent and still no date has been set for a special election to replace him in the New York State Assembly. 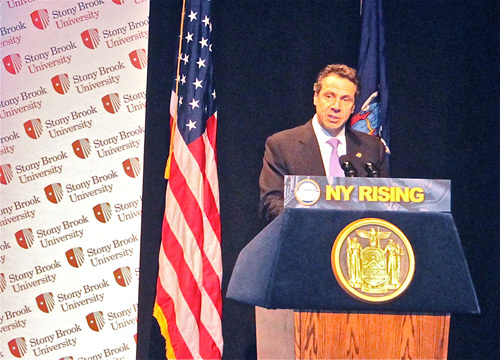 That responsibility falls squarely on New York State Gov. Andrew Cuomo, who could opt to set the special election date to coincide with local elections in November. Area Democrats have said the main reason to wait until November would be to save taxpayer dollars. But is that the only reason? The Dems have a list of potential candidates that’s shorter than a stack of pancakes. With a decent crop of interested parties on the GOP side — including two elected Southold officials — we suspect the governor may be dragging his feet for political reasons. A November election could put GOP favorite Chris Talbot — who’s up for re-election to the Southold Town Board this year — on the sidelines in the Assembly race, lest he risk giving up his town seat. It would also give the Democratic nominee, who would almost certainly be someone not currently in office, the standard six months to campaign for the seat and raise his or her profile. If the election were set today and scheduled for May 21, the date of the statewide school budget votes, candidates would still have almost two months to campaign. Hosting the election on that date would assure a higher voter turnout and than on any other non-Election Day — and would minimize election costs. If the governor’s true concern were saving money, he’d already have set an election date. After all, the former assemblyman’s staff is still getting paid, as it works to field calls from constituents who have no elected representative. The staff now reports to the office of Speaker of the Assembly Sheldon Silver, a New York City Democrat who, we’re quite certain, has very little use for an office full of East End Republicans. State records list the expenses for Mr. Losquadro’s office at $300,000 last year. Even if you subtract the assemblyman’s salary from the budget, it still costs more than $18,000 per month to keep the district offices staffed and open for business. If the Assembly post is not filled until November, taxpayers will have shelled out close to $150,000 to maintain an office with no elected leader. Gov. Cuomo needs to set a special election date quickly. He needs to set it for May 21.